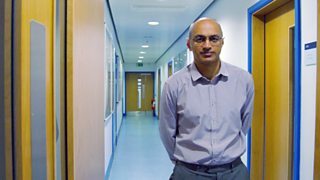 BBC Two - Trust Me, I'm a Doctor, Series 3, Episode 2 - How can I avoid getting heart disease? In order to find out the health questions you really wanted an answer to, we commissioned a poll of 2,000 people. The results showed that almost a third of those surveyed were keen to know ‘How can I avoid heart disease?’ (30% according to ComRes poll conducted online 22-23rd April 2015 with 2,051 GB respondents 18+). Heart disease is a blockage of the blood vessels that supply the heart that eventually starves the heart muscle of oxygen, killing it and causing a heart attack. In the UK, 1 in 6 men and 1 in 10 women die prematurely from heart disease, with around 200 people a day suffering a heart attack. To investigate, Michael Mosley visited Glasgow University’s Institute of Cardiovascular and Medical Sciences. He spoke to Professor Naveed Sattar, who is an expert on CVD risk and has contributed to both national and international guidelines on the issue. Smoking makes your blood more sticky, which makes blockages in the blood vessels more likely. It also may make cholesterol in the blood more toxic, making the build-up of plaques within blood vessels more likely. It increases the heart rate a little, putting pressure on the heart, and it may also irritate the linings of the blood vessels themselves. Finally, if you do have a heart attack, being a smoker increases the chance of you dying of that heart attack by 60%. However, the good news is that if you stop smoking, you can reduce all these risks quickly. The heart is pumping blood through all our blood vessels, and if the pressure is high in these vessels, the heart has to work harder to do that. High blood pressure may also create growths within the blood vessel linings themselves. Reducing salt (sodium) in your diet can reduce blood pressure, but so can adding potassium through eating more fruit and vegetables. Obesity is also a big cause of high blood pressure, and losing a few pounds can reduce it by quite a lot, reducing your risk of heart disease. Reducing saturated fat intake and lowering blood cholesterol through taking statins or other means can lower your risk of heart disease – in some cases by between 20-40%. One randomised trial has suggested that a Mediterranean diet with olive oil and nuts can reduce the risk of heart disease by about 30%. High fibre and fruit & vegetables appear to reduce your risk as well, whilst processed meats (probably by increasing cholesterol levels) increase your risk. The evidence on alcohol at the moment suggests that it is not protective against heart disease. Exercise is certainly a good way to reduce the risk of further heart disease in people who have already had a heart-attack. In people who haven’t, the evidence is less strong but generally being fitter reduces your blood pressure and is likely to be beneficial. Aspirin is recommended for people who have had a heart attack or stroke, but not for those who haven’t, as the risk of increased bleeding in the stomach, or of a rare haemorrhagic stroke, is increased and that can outweigh the benefits of the thinning of the blood that aspirin does.